As followers of Jesus, we seek to live out his instructions to us and to be his hands and feet in the world. Our friends from the Rescue Mission of Trenton are asking for gently used winter clothes, shoes, and accessories to help our neighbors keep warm through the cold winter months. If you have any to offer, please put in clean plastic bags and leave in the large box set up in the narthex. Thank you! CROP WALK Hunger Walks are community-wide events sponsored by Church World Service and organized by local congregations or groups to raise funds to end hunger at home and around the world. CWS is an ecumenical and global organization whose mission is: Feed the hungry, clothe the naked, heal the sick, comfort the aged, shelter the homeless. HPC members will be once again be walking. The HILLSBOROUGH FOOD PANTRY continues to need contributions of all non-perishable items. LAUNDRY DETERGENT, DISH DETERGENT, SHAMPOO & CONDITIONER, SNACK (Cookies, crackers, etc), JUICE BOXES, BREAKFAST CEREAL. If you are able to donate any items, please place them in the collection box in the rear of the sanctuary any time. Prayer is at the heart of our worship and life - we call on God, give thanks for His gracious gifts, and listen for his voice. At HPC we prayer for each other, neighbors, co-workers, friends, our community and the world. We want to pray for you. 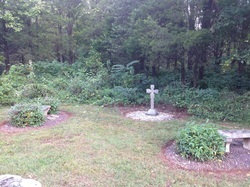 We have a secluded woodland prayer garden available to church members as well as for use by the public. If you are looking for a place of beauty and solace where you can sit for awhile, pray, and feel closer to God, stop by our prayer garden. To enter the garden, walk through the arbor to the right of the front of the church building. Hillsborough Presbyterian Church is both sponsor and host to the Hillsborough Community Garden. Opened in May 2013, the garden was created out of a desire to better steward the land we were blessed with, serve our community, and celebrate God's creation. The garden serves Hillsborough residents and neighbors interested in the outdoors, gardening, and growing fresh healthy food. The garden also serves the Hillsborough food bank by growing produce for neighbors in need in 4 communal plots known as "Carolyn's Share." www.hillsboroughcommunitygarden.org or their facebook page. The garden has a few open plots for the 2019 season. Email l.fletcher@comcast.net to inquire about gardening with us.